Darko Miličić (born 20 June 1985) is a Serbian farmer and former basketball player. He is 2.13 m (7 ft 0 in), and played center. He was selected by the Detroit Pistons as the second overall pick in the 2003 NBA draft after LeBron James, and ahead of players such as Carmelo Anthony, Chris Bosh and Dwyane Wade. However, Miličić never received significant playing time during his ​2 1⁄2 seasons with the team and was traded to the Orlando Magic in 2006. 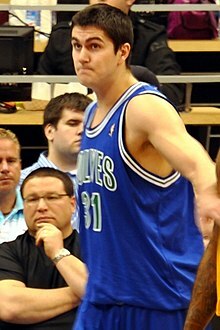 After stints with the Memphis Grizzlies and New York Knicks, Miličić was traded to the Minnesota Timberwolves in 2010, then signed a four-year contract in the off-season. However, he was released by Minnesota in 2012. He signed with Boston Celtics later that year, but was released after playing one regular-season game. He represented the Serbian national basketball team internationally. I thought as a kid that talent was God-given, but it’s not. God gives you talent and you should use that talent with the real meaning of that word. I was stubborn. Maybe being young had something to do with it. I said okay, but just not Memphis. Anywhere but there. And, of course, I went to Memphis. It’s all funny to me. I finally get a chance to play and [Dikembe Mutombo] starts taunting me and daring me to fight. Why would I need that? I didn’t understand half of what he said. I mean, he's been there [in the U.S.] 20 years and still doesn’t know the [English] language well enough. Nobody in particular annoyed me, but Kobe Bryant is the dirtiest player with the things he does on the court... But without a doubt he is a beast. He was amazing. My experience in the NBA was a catastrophe, because I’m a born winner. I don’t like losing, even in card games. I’d do a lot of things differently now. It’s true I ended up on a team trying to win a ring, which rarely happens to a No. 2 pick, but in the end we’re all looking for excuses. I could say I didn’t get a proper chance, but that’s simply an excuse; it’s up to a young player to prove himself, work hard and wait for his chance. My approach was completely different. As a No. 2 pick coming from Europe, I thought I was sent by God, so I got into fights, got drunk before practices, spiting everyone, but I was spiting myself.